The official version of the assassination of President Kennedy has been so riddled with contradictions that it is been abandoned and rewritten no less than three times. Blatant fabrications have received very widespread coverage by the mass media, but denials of these same lies have gone unpublished. Photographs, evidence and affidavits have been doctored out of recognition. Some of the most important aspects of the case against Lee Harvey Oswald have been completely blacked out. Meanwhile, the F.B.I., the police and the Secret Service have tried to silence key witnesses or instruct them what evidence to give. Others involved have disappeared or died in extraordinary circumstances. It is facts such as these that demand attention, and which the Warren Commission should have regarded as vital. Although I am writing before the publication of the Warren Commission’s report, leaks to the press have made much of its contents predictable. Because of the high office of its members and the fact of its establishment by President Johnson, the Commission has been widely regarded as a body of holy men appointed to pronounce the truth. An impartial examination of the composition and conduct of the Commission suggests quite otherwise. and Mr. McCloy, who has been referred to as the spokesman for the business community. Leadership of the filibuster in the Senate against the Civil Rights Bill prevented Senator Russell from attending hearings during the period. The Chief Justice of the United States Supreme Court, Earl Warren, who rightly commands respect, was finally persuaded, much against his will, to preside over the Commission, and it was his involvement above all else that helped lend the Commission an aura of legality and authority. Yet many of its members were also members of those very groups which have done so much to distort and suppress the facts about the assassination. Because of their connection with the Government, not one member would have been permitted under U.S. law to serve on a jury had Oswald faced trial. It is small wonder that the Chief Justice himself remarked that the release of some of the Commission’s information “might not be in your lifetime.” Here, then, is my first question: Why were all the members of the Warren Commission closely connected with the U.S. Government? If the composition of the Commission was suspect, its conduct confirmed one’s worst fears. No counsel was permitted to act for Oswald, so that cross–examination was barred. Later, under pressure, the Commission appointed the President of the American Bar Association, Walter Craig, one of the supporters of the Goldwater movement in Arizona, to represent Oswald. To my knowledge, he did not attend hearings, but satisfied himself with representation by observers. In the name of national security, the Commission’s hearings were held in secret, thereby continuing the policy which has marked the entire course of the case. This prompts my second question: If, as we are told, Oswald was the lone assassin, where is the issue of national security? Indeed, precisely the same question must be put here as was posed in France during the Dreyfus case: If the Government is so certain of its case, why has it conducted all its inquiries in the strictest secrecy? What did Oswald do on November 22, 1963? What did Oswald do in the U.S. Marine Corps, and in the Soviet Union? How did Ruby kill Oswald? What efforts were taken to protect the President on November 22? This raises my fourth question: Why did the Warren Commission not establish a panel to deal with the question of who killed President Kennedy? All the evidence given to the Commission has been classified “Top Secret,” including even a request that hearings be held in public. Despite this the Commission itself leaked much of the evidence to the press, though only if the evidence tended to prove Oswald the lone assassin. Thus, Chief Justice Warren held a press conference after Oswald’s wife, Marina, had testified. He said that she believed her husband was the assassin. Before Oswald’s brother Robert testified, he gained the Commission’s agreement not to comment on what he said. After he had testified for two days, the newspapers were full of stories that “a member of the Commission” had told the press that Robert Oswald had just testified that he believed that his brother was an agent of the Soviet Union. Robert Oswald was outraged by this, and he said that he could not remain silent while lies were told about his testimony. He had never said this and he had never believed it. All that he had told the Commission was that he believed his brother was innocent and was in no way involved in the assassination. The methods adopted by the Commission have indeed been deplorable, but it is important to challenge the entire role of the Warren Commission. It stated that it would not conduct its own investigation, but rely instead on the existing governmental agencies — the F.B.I., the Secret Service and the Dallas police. Confidence in the Warren Commission thus presupposes confidence in these three institutions. Why have so many liberals abandoned their own responsibility to a Commission whose circumstances they refuse to examine? It is known that the strictest and most elaborate security precautions ever taken for a President of the United States were ordered for November 22 in Dallas. The city had a reputation for violence and was the home of some of the most extreme right–wing fanatics in America. Mr. and Mrs. Lyndon Johnson had been assailed there in 1960 when he was a candidate for the Vice–Presidency. Adlai Stevenson had been physically attacked when he spoke in the city only a month before Kennedy’s visit. On the morning of November 22, the Dallas Morning News carried a full–page advertisement associating the President with Communism. The city was covered with posters showing the President’s picture and headed “Wanted for Treason.” The Dallas list of subversives comprised 23 names, of which Oswald’s was the first. All of them were followed that day, except Oswald. Why did the authorities follow many persons as potential assassins and fail to observe Oswald’s entry into the book depository building while allegedly carrying a rifle over three feet long? The President’s route for his drive through Dallas was widely known and was printed in the Dallas Morning News on November 22. At the last minute the Secret Service changed a small part of their plans so that the President left Main Street and turned into Houston and Elm Streets. This alteration took the President past the book depository building from which it is alleged that Oswald shot him. How Oswald is supposed to have known of this change has never been explained. Why was the President’s route changed at the last minute to take him past Oswald’s place of work? The second theory correctly placed the President’s car on Elm Street, 50 to 75 yards past the book depository, but had to contend with the difficulty that the President was shot from the front, in the throat. How did Oswald manage to shoot the President in the front from behind? The F.B.I. held a series of background briefing sessions for Life magazine, which in its issue of December 6 explained that the President had turned completely round just at the time he was shot. This too, was soon shown to be entirely false. It was denied by several witnesses and films, and the previous issue of Life itself had shown the President looking forward as he was hit. Theory number two was abandoned. and they had not known that Oswald was behind the President! 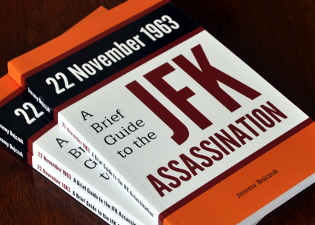 The autopsy report, they had been told by the Secret Service, showed that Kennedy had been shot from behind. The agents, however, had refused to show the report to the doctors, who were entirely dependent on the word of the Secret Service for this suggestion. The doctors made it clear that they were not permitted to discuss the case. The third theory, with the medical evidence rewritten, remains the basis of the case against Oswald at this moment. Why has the medical evidence concerning the President’s death been altered out of recognition? Although Oswald is alleged to have shot the President from behind, there are many witnesses who are confident that the shots came from the front. Among them are two reporters from the Forth Worth Star Telegram , four from the Dallas Morning News , and two people who were standing in front of the book depository building itself, the director of the book depository and the vice–president of the firm. It appears that only two people immediately entered the building: the director, Mr. Roy S. Truly, and a Dallas police officer, Seymour Weitzman. Both thought that the shots had come from in front of the President’s vehicle. On first running in that direction, Weitzman was informed by “someone” that he thought the shots had come from the building, so he rushed back there. Truly entered with him in order to assist with his knowledge of the building. Mr. Jesse Curry, the Chief of Police in Dallas, has stated that he was immediately convinced that the shots came from the building. If anyone else believes this, he has been reluctant to say so to date. It is also known that the first bulletin to go out on Dallas police radios stated that “the shots came from a triple overpass in front of the presidential automobile.” In addition, there is the consideration that after the first shot the vehicle was brought almost to a halt by the trained Secret Service driver, an unlikely response if the shots had indeed come from behind. Certainly Mr. Roy Kellerman, who was in charge of the Secret Service operation in Dallas that day, and travelled in the presidential car, looked to the front as the shots were fired. The Secret Service has had all the evidence removed from the car, so it is no longer possible to examine it. What is the evidence to substantiate the allegation that the President was shot from behind? Photographs taken at the scene of the crime could be most helpful. One young lady standing just to the left of the presidential car as the shots were fired took photographs of the vehicle just before and during the shooting, and was thus able to get into her picture the entire front of the book depository building. Two F.B.I. agents immediately took the film which she took. Why has the F.B.I. refused to publish what could be the most reliable piece of evidence in the whole case? In this connection it is noteworthy also that it is impossible to obtain the originals of photographs bearing upon the case. When Time magazine published a photograph of Oswald’s arrest —the only one ever seen — the entire background was blacked out for reasons which have never been explained. It is difficult to recall an occasion for so much falsification of photographs as has happened in the Oswald case. The affidavit by Police Office Weitzman, who entered the book depository building, stated that he found the alleged murder rifle on the sixth floor. (It was first announced that the rifle had been found on the fifth floor, but this was soon altered.) It was a German 7.65 mm. Mauser. Late the following day, the F.B.I. issued its first proclamation. Oswald had purchased in March 1963 an Italian 6.5 mm. Mannlicher–Carcano. D.A. Wade immediately altered the nationality and size of the weapon to conform to the F.B.I. statement. Several photographs have been published of the alleged murder weapon. On February 21, Life magazine carried on its cover a picture of “Lee Oswald with the weapons he used to kill President Kennedy and Officer Tippitt [sic].” On page 80, Life explained that the photograph was taken during March or April of 1963. According to the F.B.I., Oswald purchased his pistol in September 1963. The New York Times carried a picture of the alleged murder weapon being taken by police into the Dallas police station. The rifle is quite different. Experts have stated that no rifle resembling the one in the Life picture has even been manufactured. The New York Times also carried the same photograph as Life , but left out the telescopic sights. On March 2, Newsweek used the same photograph but painted in an entirely new rifle. Then on April 13 the Latin American edition of Life carried the same picture on its cover as the U.S. edition had on February 21, but in the same issue on page 18 it had the same picture with the rifle altered. How is it that millions of people have been misled by complete forgeries in the press? The authorities interrogated Oswald for nearly 48 hours without allowing him to contact a lawyer, despite his repeated requests to do so. The director of the F.B.I. in Dallas was a man with considerable experience. American Civil Liberties Union lawyers were in Dallas requesting to see Oswald and were not allowed to do so. By interrogating Oswald for 48 hours without access to lawyers, the F.B.I. created conditions which made a trial of Oswald more difficult. A confession or evidence obtained from a man held 48 hours in custody is likely to be inadmissible in a U.S. court of law. The F.B.I. director conducted his interrogation in a manner which made the use of material secured in such a fashion worthless to him. This raises the question of whether he expected the trial to take place. Another falsehood concerning the shooting was a story circulated by the Associated Press on November 23 from Los Angeles. This reported Oswald’s former superior officer in the Marine Corps as saying that Oswald was a crack shot and a hot–head. The story was published widely. Three hours later AP sent out a correction deleting the entire story from Los Angeles. The officer had checked his records and it had turned out that he was talking about another man. He had never known Oswald. To my knowledge the correction has yet to be published by a single major publication. The Dallas police took a paraffin test on Oswald’s face and hands to try to establish that he had fired a weapon on November 22. The Chief of the Dallas Police, Jesse Curry, announced on November 23 that the result of the test “proves Oswald is the assassin.” The Director of the F.B.I. in the Dallas–Fort Worth area in charge of the investigation stated: “I have seen the paraffin test. The paraffin test proves that Oswald had nitrates and gunpowder on his hands and face. It proves he fired a rifle on November 22.” Not only does this unreliable test not prove any such thing, it was later discovered that the test on Oswald’s face was in fact negative, suggesting that it was unlikely he fired a rifle that day. Why was the result of the paraffin test altered before being announced by the authorities? Oswald, it will be recalled, was originally arrested and charged with the murder of Patrolman Tippitt. Tippitt was killed at 1:06 p.m. on November 22 by a man who first engaged him in conversation, then caused him to get out of the stationary police car in which he was sitting and shot him with a pistol. Miss Helen L. Markham, who states that she is the sole eye–witness to this crime, gave the Dallas police a description of the assailant. After signing her affidavit, she was instructed by the F.B.I., the Secret Service and many police officers that she was not permitted to discuss the case with anyone. The affidavit’s only description of the killer was that he was a “young white man.” Miss Markham later revealed that the killer had run right up to her and past her, brandishing the pistol, and she repeated the description of the murderer which she had given to the police. He was, she said, “short, a little heavy, and had somewhat bushy hair.” (The police description of Oswald was that he was of average height, or a little taller, was slim and had receding fair hair.) Miss Markham’s affidavit is the entire case against Oswald for the murder of Patrolman Tippitt, yet District Attorney Wade asserted: “We have more evidence to prove Oswald killed Tippit than we have to show he killed the President.” The case against Oswald for the murder of Tippitt, he continued, was an absolutely strong case. Why was the only description of Tippitt’s killer deliberately omitted by the police from the affidavit of the sole eye–witness? Oswald’s description was broadcast by the Dallas police only 12 minutes after the President was shot. This raises one of the most extraordinary questions ever posed in a murder case: Why was Oswald’s description in connection with the murder of Patrolman Tippitt broadcast over Dallas police radio at 12:43 p.m. on November 22, when Tippitt was not shot until 1:06 p.m.? According to Mr. Bob Considine, writing in the New York Journal American , there had been another person who had heard the shots that were fired at Tippitt. Warren Reynolds had heard shooting in the street from a nearby room and had rushed to the window to see the murderer run off. Reynolds himself was later shot through the head by a rifleman. A man was arrested for this crime but produced an alibi. His girl–friend, Betty Mooney McDonald, told the police she had been with him at the time Reynolds was shot, according to Mr. Considine. The Dallas police immediately dropped the charges, even before Reynolds had time to recover consciousness, and attempt to identify his assailant. The man at once disappeared, and two days later the police arrested Betty Mooney McDonald on a minor charge and it was announced that she had hanged herself in the police cell. She had been a striptease artist in Jack Ruby’s nightclub, according to Mr. Considine. Another witness to receive extraordinary treatment in the Oswald case was his wife, Marina. She was taken to the jail while her husband was still alive and shown a rifle by Chief of Police Jesse Curry. Asked if it were Oswald’s, she replied that she believed Oswald had a rifle but that it didn’t look like that. She and her mother–in–law were in great danger following the assassination because of the threat of public revenge on them. At this time they were unable to obtain a single police officer to protect them. Immediately after Oswald was killed, however, the Secret service illegally held both women against their will. After three days they were separated and Marina has never again been accessible to the public. Held in custody for nine weeks and questioned almost daily by the F.B.I. and Secret Service, she finally testified to the Warren Commission and, according to Earl Warren, said that she believed her husband was the assassin. The Chief Justice added that the next day they intended to show Mrs. Oswald the murder weapon and the Commission was fairly confident that she would identify it as her husband’s. The following day it was announced that this had indeed happened. Mrs. Oswald, we are informed, is still in the custody of the Secret Service. To isolate a witness for nine weeks and to subject her to repeated questioning by the Secret Service in this manner is reminiscent of police behavior in other countries, where it is called brainwashing. The only witness produced to show that Oswald carried a rifle before the assassination stated that he saw a brown paper parcel about two feet long in the back seat of Oswald’s car. The rifle which the police “produced” was almost 3½ feet long. How was it possible for Earl Warren to forecast that Marina Oswald’s evidence would be exactly the reverse of what she had previously testified? After Ruby had killed Oswald, D.A. Wade made a statement about Oswald’s movements following the assassination. He explained that Oswald had taken a bus, but he described the point at which Oswald had entered the vehicle as seven blocks away from the point located by the bus driver in his affidavit. Oswald, Wade continued, then took a taxi driven by a Daryll Click, who had signed an affidavit. An inquiry at the City Transportation Company revealed that no such taxi driver had ever existed in Dallas. Presented with this evidence, Wade altered the driver’s name to William Whaley. The driver’s log book showed that a man answering Oswald’s description had been picked up at 12:30. The President was shot at 12:31. D.A. Wade made no mention of this. Wade has been D.A. in Dallas for 14 years and before that was an F.B.I. agent. How does a District Attorney of Wade’s great experience account for all the extraordinary changes in evidence and testimony which he has announced during the Oswald case? These are only a few of the questions raised by the official versions of the assassination and by the way in which the entire case against Oswald has been conducted. Sixteen questions are no substitute for a full examination of all the factors in this case, but I hope that they indicate the importance of such an investigation. I am indebted to Mr. Mark Lane, the New York criminal lawyer who was appointed counsel for Oswald by his mother, for much of the information in this article. Mr. Lane’s enquiries, which are continuing, deserve widespread support. A Citizen’s Committee of Inquiry has been established in New York, at Room 422, 156 Fifth Avenue, New York. N.Y. (telephone YU9-6850) for such a purpose, and comparable committees are being set up in Europe. We view the problem with the utmost seriousness. U.S. Embassies have long ago reported to Washington world–wide disbelief in the official charges against Oswald, but this has scarcely been reflected by the American press. No U.S. television program or mass circulation newspaper has challenged the permanent basis of all the allegations — that Oswald was the assassin, and that he acted alone. It is a task which is left to the American people. Several HTML elements, such as headings and lists, have been introduced in order to make the article suitable for the web. Bertrand Russell’s original text is unchanged, including his mis–spelling of Officer J.D. Tippit’s surname.